Iconic Indian two/three-wheeler major Bajaj Auto has been hailed by Niti Aayog CEO Amitabh Kant as being a shining exemplar of the Make In India initiative, and also for a recent campaign it has launched to showcase how it has spread its and Indian manufacturing's wings far beyond the nation's borders. Kant was in attendance at a Bajaj Auto campaign event where he remarked on the extraordinary export numbers churned out by the Pune-based company on a yearly basis. He put forth that Bajaj exports over 2 million (20 lakh) vehicles per year to 70 countries around the world and cited its passion and engineering chops. The film begins in India, seemingly at its extremes - first south and then clearly in the desolate and starkly beautiful north. 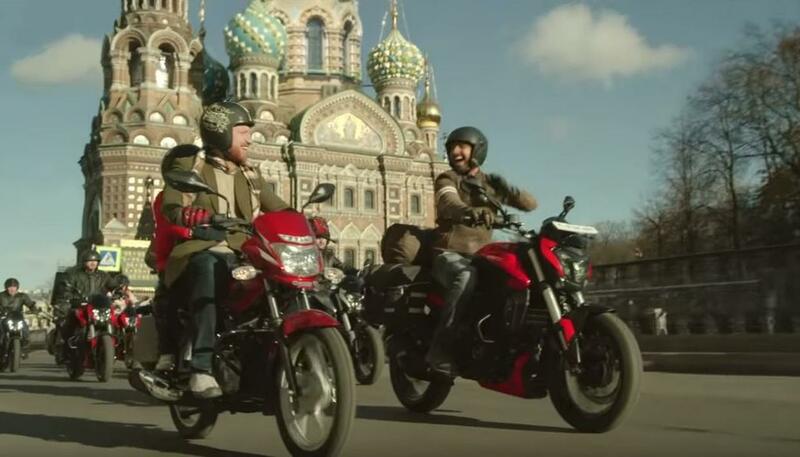 Very quickly, however, it heads further north - Russia north - bringing famous Muscovite monuments and cityscapes to the fore before a troop of bikers on Bajaj motorbikes takes off on another adventure. Very quickly the scene shifts to Mexico where even more bikers join in, proceeding to a Giraffe-filled Africa, then Malaysia, Turkey and the Hagia Sofia, Egypt and finally, Dubai. The creative, which Amitabh Kant has described as fascinating, encapsulates how a company and brand that has its roots firmly in India (it's earlier Humaara Bajaj campaign jingle is part of Indian advertising folklore) has now evolved to become a global force, leading the way in terms of India's two-wheeler exports which at 5.6 lakh in the April-July 2018 quarter roughly equalled the sum total of the export figures of its nearest six competitors, while maintaining a remarkable 26% growth rate. The Make In India initiative refers to the flagship industry-focused movement launched by the Government of India for both domestic and foreign companies to manufacture in India for sales in India and abroad. That the automobile industry - meaning not just the big marques but also their vast and interconnected supply chains - has become a beacon for the development of manufacturing and engineering in the country is backed by some stellar growth numbers. As per the Society of Indian Automobile Manufacturers (SIAM), in April-July 2018, over automobile exports were growing at a rate of over 16%. SIAM also reports that over 40 lakh passenger vehicles, commercial vehicles, three-wheelers and two-wheelers were exported in 2017-18. Of these, two-wheelers formed the bulk, at an extraordinary 28 lakh units exported.